Art = Life at R.L. 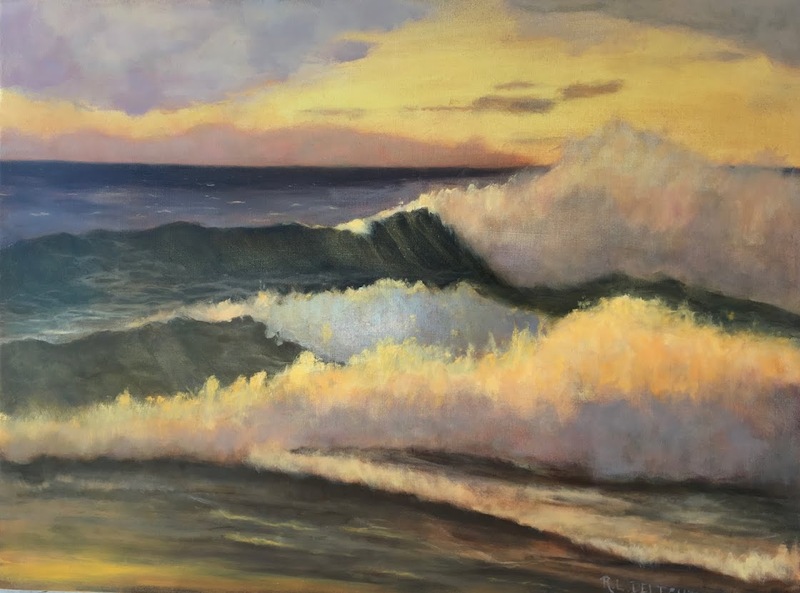 Delight Fine Art: Week Three, Adding a New Layer. This week was a real challenge. In addition to the regular classes, I also attended the recommended evening classes. These are strictly still life and give us more opportunity to practice with more guidance. The classes are on Tuesday and Thursday evenings from 6:00 to 9:00. The regular class ends at 4:00. That leaves me just enough time to go home, eat, and come back again. I have had to get extra organized and plan and prep a slow cooker meal the day before so that dinner is all but ready when I walk in the door. My husband has band rehearsal on those evenings too so we both are going out for the evening. It makes for a long, twelve hour day with nine solid hours of drawing. So, this week's class results. The top picture is a still life we did on Tuesday. As you can see they are getting a bit more complex. I must remind people that none of these are finished works nor do they even come close to being finished. Each one is worked on for three hours and that is it at this time. 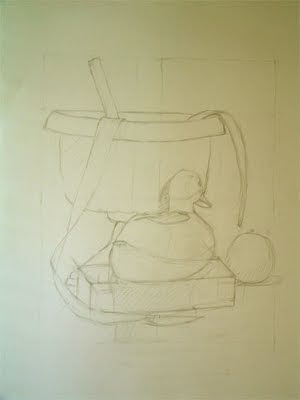 The duck planter in the above picture was challenging at any angle but I was looking at the tail end of it. I wish I could say I am getting better at drawing books but they give me a hard time too. I am planning to draw stacks of books tomorrow to see if I can become the queen of drawing books, or at least the duchess! 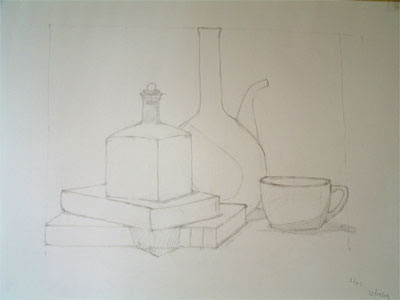 This still life was one I set up and drew on my own. I rather like making my own still life compositions. Note that I included books knowing how much I needed to work on them. I was tweaking the tea cup when time was up so it still looks rather lopsided. We are starting to include shadows as shapes in our still life. One exercise we did this week was to draw the shapes of the shadows and light. Very challenging because it required a shift in the way we looked at the objects. I suspect we will be doing more of that as it was the final still life we did on Thursday. Friday was the usual model sketching and construction drawing. I must say that model sketching is my favorite thing at the moment. I say at the moment because for us first year students, it is still an occasional treat. The other students do a lot more model sketching. It is as tiring to the artist as it is to the model. I suspect that when we do a lot more model sketching we will look back at the long hours of sitting at an easel with some longing. Break times are interesting at the school when they happen to converge. The first year students all stand while the others all flop into chairs. I will do a special post on just gesture sketching with pictures of the drawing progression. The picture below is of Friday's construction drawing. Friday afternoon was painful as I was so very tired from such a busy week it was all I could do not to lean my face against my drawing and fall asleep. We had to draw a stack of the Duplo Lego blocks. I had just sketched in the nubby things for reference at this point. The perspectives all seemed to be going in the right direction when it was time to leave but we sort of packed up a few minutes early and the teacher hadn't gotten back to us for another evaluation. It wouldn't have done me any good anyway as I was so very tired, nothing more was sinking in. It makes me tired just looking at the drawing! Another round for next week. It does seem like we progress a bit with every session. Not so much in the way the pictures look at this point but in the way we draw and perceive the objects. I am starting to catch my own errors in placement and proportion, which is good. I have always been the sort that has to make almost every mistake in the book before I get it right but I do eventually learn. I think I will take a Sunday afternoon nap...to rest up for next week! Oh that sounds like a tiring week!! Even though this is where you want to be, it still sounds tiring. That's good that you feel like drawing some on your own too. 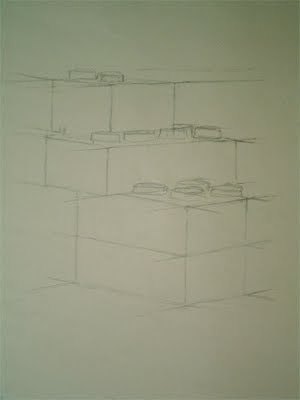 The one drawing class I took, I noticed that with things that I really liked drawing, I had better results. A still life of something that didn't speak to me, and at a weird angle yet, was sure to bug and not come out so well. Hopefully you've had a nap today so you're ready for the next week! Thanks for keeping us posted about what you're doing.